At the beginning of the year, I knitted a baby blanket for my niece. 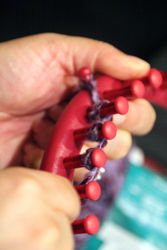 In that post, I talked about how I’d learned how to knit when I was younger, but never really finished any real projects. 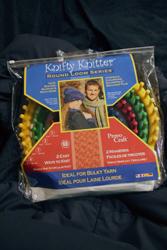 Well, when Nick and I were in a craft store a while ago, I saw these “Knifty Knitter Looms” that boasted, “Professional results for everyone!” I was totally intrigued, and since the sets were on sale, I picked one up. 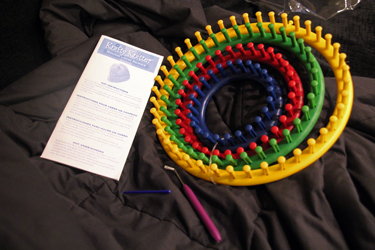 Tonight, on a rainy Christmas Eve, I decided to finally bust out my knitting looms and see what they were all about. 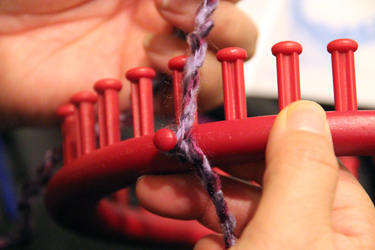 The kit I got was a set of round looms – I didn’t get a chance to look at all the ones that were at the store, but the round looms for some reason appealed to me – I thought they seemed the most versatile, because they seemed to be able to produce circular pieces, which I’d never known how to do, and I thought they should be able to do flat pieces as well. 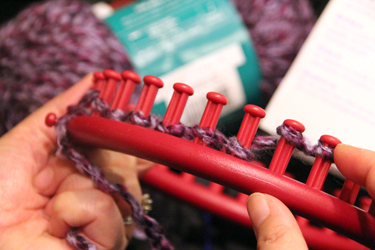 This kit came with four looms of different sizes, a loom hook, and a yarn needle. I decided the best way to take this system on a test drive was to just look at whatever project(s) were in the manual that came with them. 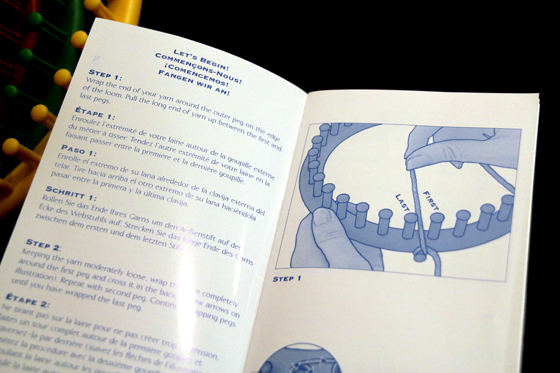 This manual had instructions on making a hat, which basically begins with just knitting all the way around the circle. Cool! Seemed simple enough. I loved how it’s broken down into totally basic steps. 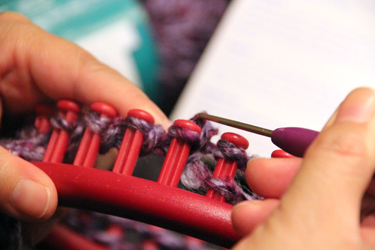 First, I anchored my yarn to the little peg on the outside of the loom. 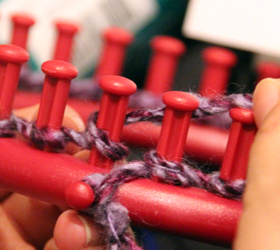 Then, I did what they call an “e-wrap” on each of the pegs – basically you just wrap the yarn around the back of the peg, come around the front, and then you move to the back of the next peg, and so on all the way around the loom. 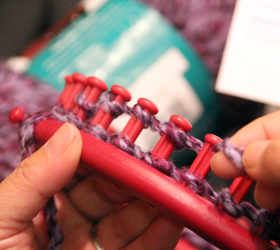 Once you’ve wrapped once all the way around, you push the loops down onto the loom. After all the loops were pushed down, I started on the second round of wrapping, e-wraps, just like the first round. Yay! Second wrap done! After this second round of wraps, I anchored the working yarn (the string coming from the skein) on that outside “anchor” peg again. 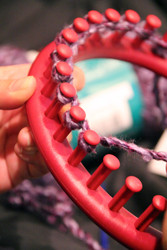 Next, you use the loom hook to grab the bottom yarn loop on the first peg you started with, and bring it up over the top yarn loop on that peg, over the top of the peg and around to the back of it. And you just keep on goin’. 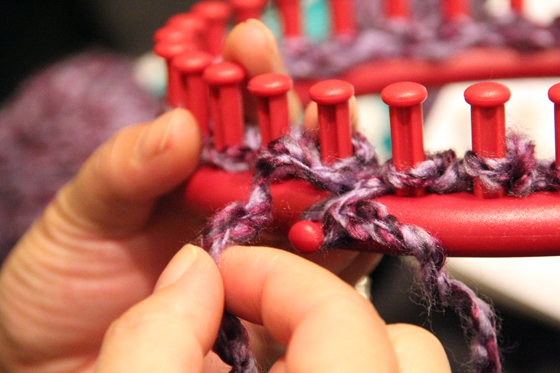 I continued this all the way around the loom. 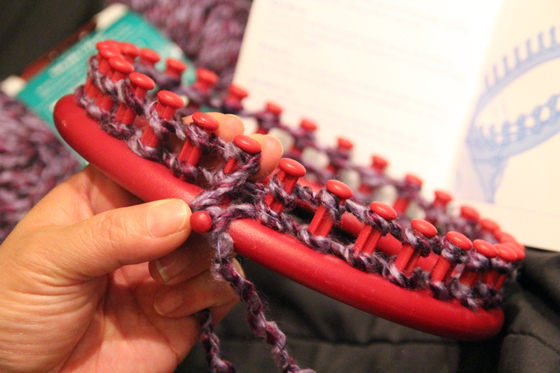 My first round of knitting on a loom, done! 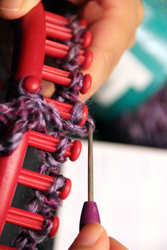 I pushed all my loops down again, and then I unanchored the working yarn, and started those e-wraps around again. You just continue this process until your piece is the length you want! This is awesome! 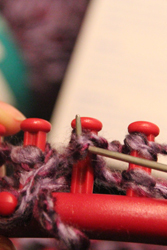 Knitting on a loom is supposed to be a little faster than traditional knitting with needles, and this first round did seem pretty fast – I also like how the tops of the pegs help keep the yarn from slipping off – I’m always afraid of loops slipping off (dropping stitches) when I’ve knitted with regular knitting needles before. 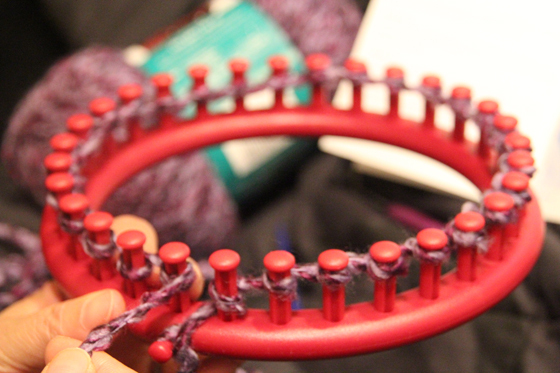 I’m really happy that these looms seem to work so well, and I’m totally excited to see what I can make with them. Ingenious! 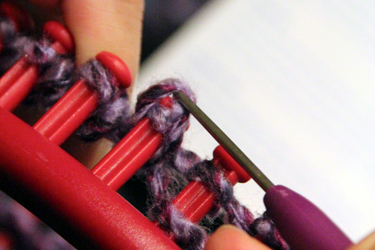 I always used to worry about poking someone or myself with the tips of the knitting needles.